The Aikawa-Koko-Kan exhibits many archaeological materials which the founder, Mr. Shiga Aikawa, collected over many years. ‘Shiga was born in 1866 as the first son of a headman of Isesaki-machi. He visited America alone in 1885. He returned temporarily from Canada in 1893, and in the next year he became a member of the Tokyo Anthropology Society. He presented some important anthropological photographs and materials of Canadian Indians to Tokyo Imperial University. He collected archaeological materials in Isesaki when he returned temporarily. After he permanently returned in 1914 to inherit his father’s, he became the chief of the post office and a member of the town assembly. Shiga tried to establish the Aikawa-Koko-Kan in 1936 but was unsuccessful due to the war. In 1950, the year after Shiga’s death, his eldest daughter, Tetsuko, established the Aikawa-Koko-Kan in accordance with her father’s last wish that it be used for the public. It became a nonprofit foundation in 1993. The museum was the house of an officer of the town in the Edo period. 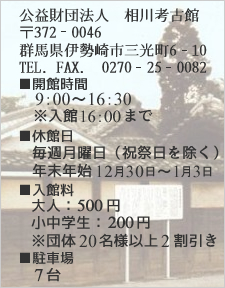 It consists of a main building, warehouse, store, Inari shrine, tea-ceremony house and storeroom. Spears and other arms, as well as shop photographs and signs which were used in this house when it was a store, are exhibited in the entrance hall. On the ceiling between the entrance hall and middle room you can see ventilation holes used for silkworm culture. In the warehouse, some archaeological materials which were excavated in Isesaki, and Canadian Indian materials are exhibited. The most important artifacts are stone tools earrings ,and clay figures ( doguus ) excavated at the Yoneoka site; pottery and stone tools excavated at the Yasaka site; clay images ( haniwa ) excavated around Isesaki City; and foundation stones and old roof and eave tiles excavated at the ruins of Kamiueki temple. In the storeroom, four clay images ( haniwa ), which have been designated as important cultural assets by the Ministry of Education, are exhibited. The four clay images are a statue of a man found at Oizumi, a statue of a man found at Isesaki, a seated figure of a man playing a Japanese harp found at Maebashi, and an armed statue of a man found at Ota. The Inari shrine is made of fire proof clay, and is also used as a safe. The tea-ceremony house, called SHOKA-AN, is a wooden sukiya style building. It was built in 1860 in traditional tea-ceremony house style. It is one of the oldest tea-ceremony house in Gumma Prefecture. The tea-ceremony room is a four and a half mat room. Parts of the room were made using different techniques which expressed the owner’s thoughts. Copyright © 2019 相川考古館 All rights Reserved.